I don't know much about politics, but enough to know I don't care for it. I'm rather like the little old lady who once said, "I never vote, it only encourages them" (but the resemblance ends there!) Nevertheless this is a favorite episode, and here's why. Like all of Steptoe and Son it doesn't require familiarity with the subject to enjoy it. And as with the relatively few Galton and Simpson scripts that examined politics directly, both Labour and Conservatives are parodied equally. Everybody gets to laugh regardless of their convictions. The difficulty of achieving this so effectively without offending anyone (with the possible exception of some career politicians and their ilk) is yet another reason to admire the results: unequivocally huge laughter. It's election time, and Harold has plastered pro-labour placards all over the cart. But back from his round he discovers Albert has spared no efforts either. Not just pro-conservative posters on their gate and windows, but he's painted "vote tory" all over the front of their home. A bit awkward because as chairman, Harold isn't just hosting the local labour party committee that evening, he also hopes to be nominated to local ward. Albert chides, "More like a candidate for the psychiatric ward!" After chasing Albert around the yard for a while, Harold says, "Whereas my beliefs are sincerely held, the result of years of deep thought, observation and rationalization, your particular brand of squalid nasty antisocial opinion is directly attributable to a basic desire to get right up my shonker!" It's meeting time and Harold is eager to make an impression...so he's dressed up like Harold Wilson, raincoat and pipe. The committee members arrive followed by a labour party official (Dudley Foster) who's ostensibly there to observe the proceedings. He's dressed like the PM too, raincoat and pipe. Harold introduces him to his pater, "This is Mr. Stonelake, the agent." Albert replies, "What for, raincoats?" The meeting progresses and Albert's cheeky remarks right along with it. Harold tries to coax him into leaving, "Would you like to read a book or watch television or something?" Albert says, "No no, I'm all right, it's much funnier here. You carry on." The time has come for council nominations. 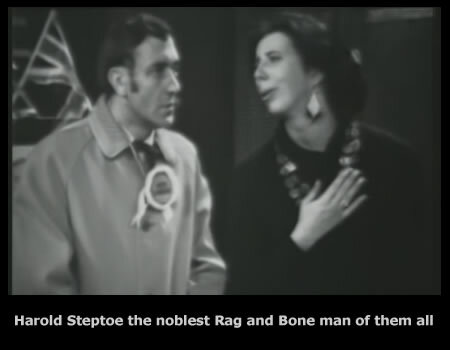 A woman who's unable to contain that she fancies Harold, gushes with enthusiasm, "I nominate our chairman Harold Steptoe, I don't think we could choose a better man! His charm, his personality, his integrity! His keenness and ability are beyond question!" Albert mutters, "Get in there Harold, it's your birthday." "My Old Man's A Tory" is an evenhanded, acute and timely episode with no agenda other than laughter that also encourages critical thinking. That is the heart of quality comedy, and a privilege to enjoy. Brilliant! 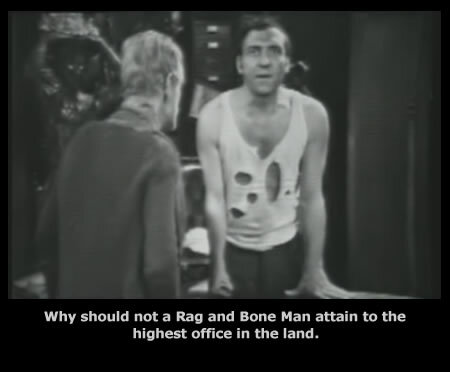 Politics hits the Steptoe household, with Harold setting his sites on a seat on the local council. But will Albert vote for him ?